to make the storyline for the clans. Beside making the storyline for the clans, we also make sure that it is followed. We keep track of the time, and announce night time and day time in the RPs. We are also in charge of the nature and changing the season. Awesome job Eagle! If no one joins the Guild, can I take the Deputy position? And about the allegiances, how about we set the deadline for this weekend? Because we really need to record all the name changing in the ceremonies that have been going on. Good job with the lets go and get it done attitude! Visa Versa, if that's okay. So I'll do the MoonClan and SunClan, and you do OceanClan and LavaClan. this is where we rush out the door and start, but since it's the computer, open a new tab or something. Sure. Do you want to do anything in particular? Eagletalon wrote: Sure. Do you want to do anything in particular? Well, I'm not really sure what you've gotten so far. I like working on the allegiances, although it can be very tiring. LOL. If you guys haven't already done MoonClan Allegiances, I would like to do that. Also, could you keep me updated on everything? I don't want to miss out on anything. Okay, eaglestar, you can do the MoonClan allegiances. You know how to, right? Ocean, do you want me to do LavaClan allegiance also, in that case? Eagletalon wrote: Okay, eaglestar, you can do the MoonClan allegiances. You know how to, right? Where do we post the Allegiances? in the main topic for the clan you are making it for. Like, you post it as a subtopic. Eagletalon wrote: in the main topic for the clan you are making it for. Like, you post it as a subtopic. ok, i think i've got it...i might only be able to do it on weekends though, so it might take a while. what hav u and ocean already done? Star, we have a Guild page in the General Disscussion section, where you can see all of the guilds available. You have to be in a minium of 4 guilds with a maxium of 6 guilds. Leaders of the guilds are in charge of the guild, and Deputy of the guild make sure the leaders orders are followed through and are in charge when the leader is not there. Once you have decided what guilds you want to be in, please tell me. So I am doing Lava, instead? Okay! I'm posting the allegiances here because I don't really get what you said, Ocean. If you could, copy and paste these into the appropiate spots, or give me a link to it. Smaller and thinner than other cats, and can reach prey and herbs where other cats can't. Extremely in danger if exposed in a battle, does not usually have the strength to fight back..
ok no im not done but i hav 2 get off. That's good, but I don't think you need age because the cat will keep growing. What does PP mean? For apprentices, their descriptions go in their apprentice slot. IDK, did you check the auditions for their descriptions? Um, I asked if you wanted me to do Lavaclan for you, Ocean, and you would only do OceanClan. But whatever. Eagletalon wrote: That's good, but I don't think you need age because the cat will keep growing. What does PP mean? PP means the person that's playing the cat. Also, for the allegiances, should we do ones that only have the minimal description, like fur eye color, and save the whole descriptions for when we make a master list of cats based on their user or family? after the allegiances are done, that (the master list) is our next project. Is it okay if I make some changes? 1) Leader does not have to have a permanent kits spot, or an old leader slot. Yeah...sorry. You did a great job in making this, but what can i say, i'm an over-perfectionist. Note: Medicine cats that have kits here aren't breaking the code, they are allowed to. Eagletalon wrote: Is it okay if I make some changes? ok, sorry, but i just thought that medicine cats weren't allowed to have kits. and wasn't this supposed to be based on real warriors? I think we did not have the Warrior Code up back then. We have it up now in the FAQ section! I need to find a way to get people to HAVE TO read that before they begin, it will make things easier! Anyway, I did Lava. So whatever. Is it okay? We can do whatever order you want to do now, but that is how we used to do it. That is also how my allegiance is set up, but I can change it based on what one you want to do. Oh and I will get rid of the ages now, too. yeah, the LavaClan allegiance is fine. I don't really know what everybody is talking about, but I say we keep the format the way it is in the warrior cat series, unless you have something serious against it. and as an opinion, should we do short allegiances, like only fur color and eye, in the allegiances? We could put the full descriptions in the master list. Maybe that isn't a good idea, but I'm only saying because they sometimes give headaches to find and read with really long descriptions. I could go either way. Before I rped here, I rped on Amazon and they orginally made REALLY long and VERY detailed descriptions, but since the allegiances got so long, they made it only physical stuff, since they also thought that by doing that you can make the cats personalitiy whatever you wanted and not so strict to what you wrote before. We could make 2 lists, one with descriptions all full, and 1 with small descriptions. 2) the allegiances for each clan, the ones in the main clan RP topic, will only list the short description, but don't change it yet! 3) we are going to be making a long list according to user, was it? or family, and that will have the full descriptions. OR we could just make a long list. The Allegiances in the Clan Section will have the shortened version. We will also make a list that includes the long version. We also making the family trees, right? I'm in the Roleplay Librarian guild, so should I just make the topic? Then, I'll make one for All cats in Awesomecl4n and copy all the allegiances and paste them into that long list that we can sort out later and then we can make the shortened allegiances how's that? To make the storyline for the clans. Beside making the storyline for the clans, we also make sure that it is followed. Ok so here are the plots! Any questions, ideas, comments, or concerns? comments: THAT IS AWESOME! I think that it is very creative how Sunclan is stealing territory and Lavaclan (kinda) decides to help Ocean- and Forest-clans. =What are we going to do about Forestclan? Are they goin to merge with Oceanclan or has something already been decided? haha you spelt my name right! okay........just slightly confused :3 can i help anyone in any way? No. 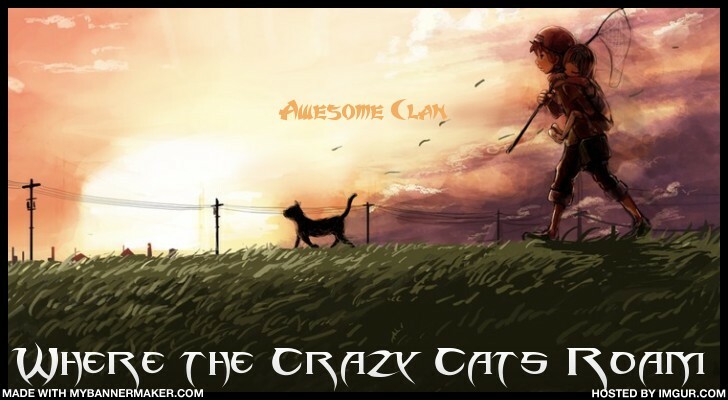 They become DawnClan. Actually, that's a whole new plot. Also, ideas for Lava. A sign. Medicine cats. Yeah. More in the medicine cats topic. Edit: May I be deputy? uh, you could do whatever you see is fit! Okay for Lava, they could have a sign or a prophecy, like Jay said. Maybe you could brainstorm that further? This is the next plot! Forestclan returns to their island and attempt to rebuild their home. Meanwhile, 2 cats, 1 of Oceanclan and 1 of Lavaclan are given a prophecy to help rebuild the ancient clans (Medicine Cat Guild will do the prophecy) The 2 cats leave their clans to fufill the prophecy from Spiritclan (They might have people come with them, it depends) The cats leave their island and go to the island where Forestclan is. They team up to help find out more about the ancient clans from Forestclan. After some researching around the island and from Forestclan, they learn that Forestclan used to be an ancient clan, under the name of Dawnclan. They learn that Dawnclan and another clan, whose name they do not know yet also lived on the same island as the other clans. Since the island was very crowded, Dawnclan and the other clan left to the other island, and were removed of the other clans. On this island, in Dawnclan, there was a rebellion led by a cat named Forestcreek whose cats left Dawnclan and headed back to the main clan island where they made their own clan called Forestclan. But, Oceanclan, Sunclan, and Lavaclan teamed up and chased them off the island. When Forestclan returned back, they found out that Dawnclan had been wiped out due to a horrible flood. The survivors of Dawnclan joined Forestclan who made their home where Dawnclan lived. The other survivors became rogues. Slowly the fact that Forestclan was called Dawnclan was lost to time, until now. Forestclan then decides to change their name to Dawnclan, and one of the cats stays behind to help them, since that is her part, help Dawnclan. The other cat, heads deeper into the island and meets lots of rogues. From them she gathers information about the other clan, Twilightclan. Twilightclan was wiped out around the same time of Dawnclan, but due to a different reason. They were killed by a huge volcanic eruption, which killed the cats. The clan had even less survivors than Dawnclan, due to fire, lava and smoke. That cat then begins to recruit cats into joining an all new Twilightclan (like how Firestar did with Skyclan) Some cats join and she helps the new clan. From there, new problems run wild with the new clans. Dawnclan has a badger problem (remember Eagle?) and another flood. Twilightclan, has problems from the other rogues in the area, which steal their food and do sabotage and stuff like that. The 2 clans decide to help one another with their problems and with each others help, they defeat the badgers and the rogues and Dawnclan is given materials to build a better camp. That plot is long and still needs some brainstorming. Also, while this is all happening, the other clans will be having problems as well. One more thing, Twilight and Dawn are going to be separate from the other clans. 2 groups of 4 clans=8 clans all together. We also are going to need canditates for the prophecy, and a prophecy, and some more ideas! shouldn't the Roleplay Librarian Guild do the allegiances? Since they are in charge of the clans and stuff like that. It can be the Family Tree Guild, if you want it to be, though. Ahh! The badger plan! I wondered when we were getting to that (finally). To narrow it down, should the candidates be a tom and a she-cat? Two she-cats? Both warriors, right? Unless an apprentice is going to go or something. What kind of other ideas? .....I thought the RLG (guess what that is) was supposed to do roleplaying rules and following the storyline thing. I didn't know it had to do cats, because Family tree, is well families, so.........I don't know! Oh yeah! RainClan doesn't have an allegiance made, so you can do that if you want to, Willow. Yeah, Med. Cat Guild will make the prophecy and then send it back over here. And if we like it then good! OH! You know what we should do? We could make all these insulting nicknames for the different guilds! Won't that be fun? Jk. I don't know...any ideas? What do you guys think? Well ideas for rogues, cats of propehcy, if any cats will come with them and if so who, who will tell them about Dawnclan, why Forestclan will change their name to Dawnclan (maybe an omen), and any other problems or ideas. Since it is already here, Faimly Tree can do it. But if you do any of the other ones, they all have a previous allegiance that can be found either in those sections or in the Archives. We could keep Loudfire because I took her, unless you want to change, but with LavaClan...yeah. We need a change. Are we going to do another she-cat, or someone else? A dead/dark forest at night. Then, dawn breaks and the forest is renewed? Or something like that? Any ideas for the other cat? It can be either a male or female. Also, the plot for Snow and Rain? One last question, I know I've been pestering you about this since.. Forever, but may Pansypaw become a full medicine cat? He's the only medicine cat left. Yes, thats kinda mean on him though considering that he's only one med cat and you need two. But if he's the only medicine cat, he doesn't have a mentor to make him a full medicine cat. And no offense, but we need to figure out this prophecy cat. If we take it one step at a time, should it be a tom or a she-cat?